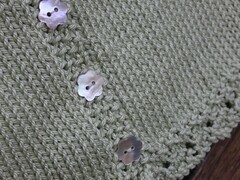 So, I’ve finished the green cotton cardi for Miss Abigail’s first birthday. I love the buttons, don’t you? The book was published in 2000, I think when Rowan bought them out but you might get it on Ebay. I have to say that I didn’t like the way the pattern was written. Particularly, the set up rows. I very rarely complain about a pattern but I really did have to use DH’s logic on this one. I think I restarted it about 4 times but once I got the hang of it, it was fine. I love the sheen this cotton gives to the garment. It looks quite dressy. 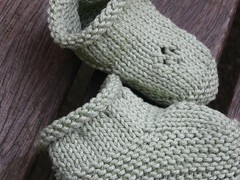 I made some bootees too. Couldn’t resist. Is a bit of a mish mash of about 3 patterns. I made some mary jane-style ones initially but they were enormous when I secretly tried them out on her! I have signed up for Cotton Strudel’sMag Swap, so sign up before Monday, 12th June or you’ll miss out! And have also outed myself for Turkey Feathers’*Finish What You Have *month in a faint-hearted attempt to finish Mystical Stripe and this baby quilt.